Virginia Tech fans got great news on Selection Sunday with the announcement that Justin Robinson will be returning from injury in time to play with the Hokies in the NCAA Tournament. Robinson missed 12 games while dealing with an injured foot, and his absence was felt beyond his averages of 13.7 points and 5.2 assists per game. A four year-starter for Buzz Williams in Blacksburg, Robinson is a leader on the floor who pairs with talented guard Nickeil Alexander-Walker to make one of the best backcourts in the ACC when both players are healthy. Though he's been out of the lineup, Robinson was far from an inactive member of the program over the last dozen games. He maintained his role as a vocal presence in the locker room and the huddle, and even looked like another assistant coach on the sideline with adjustments and advice for Alexander-Walker and teammate Ahmed Hill during games. No one on the team has more experience trying to execute what Williams wants from the Hokies on the court, and he deserves a good portion of credit for his contributions to getting Virginia Tech to three consecutive NCAA Tournaments for the first time in program history. Virginia Tech needs Robinson on the floor in order to reach its ceiling in the NCAA Tournament, not only for the production and leadership but even as another body for an already short rotation. Since the injury, the Hokies have kept only about a six or seven man rotation as a result of attrition that has included not only injuries but disciplinary issues. 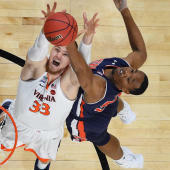 Robinson's return should be a spark for this team, an emotional and physical boost for everyone in the lineup as the senior looks to lead Virginia Tech on a deep run into the tournament.